Farmers Wifey: The Wifey does hats. Today I want to talk about hats. I love hats. I especially love them the week leading up to the hairdresser (ladies you know what I'm talking about!). I wear them for sun safety and also for bad hair days. 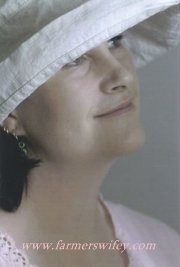 Here's me with my favourite white hat, looking very arty. And pensive. I could have been thinking of a flowery meadow but I was probably thinking of dinner that night and the large pile of washing to be done. Here's me with my Akubra and I think I look really good wearing it. I feel like I really am a Farmers Wifey in this. And here is my favourite cap. I wear this alot. The Hubbster has a matching one that we had our wedding date embroidered on our honeymoon. Mine also reads "we tied" and his says "the knot". Here's my wedding hat. Well it's kind of a hat. 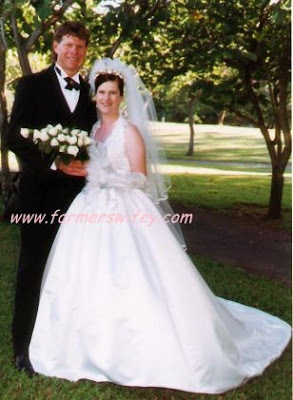 Actually it's a very long veil and a gorgeous tiara. But we'll call it a hat for the sake of this post. I'm also wearing a very handsome new husband. I had a great photo of a drunken pink veiled hat that I wore on one of my hen's nights (I had two). But as it's stored away somewhere I'll leave you with an embarrassing hair photo from the eighties where I actually should have been wearing a hat. 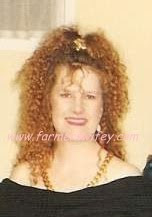 I dare you to get a perm like that again. Love your hats. I think the white hat picture is stunning! I rarely wore hats until I move to Colorado. Now it is windy and sunny. The hat is usually always tightly crammed on my head to keep my hair out of my eyes and shield my eyes from the sun. Love your hats! I look terrible in hats and love them. While growing out my very very short hair I wore a baseball cap for almost 4 months. Whew. Great hats, I love the one of you in the white hat especially. I on the other hand don't wear hats at all unless it is absolutely necessary.